Paul McKee’s “Northside Regeneration” has been controversial since before it became public, it has faced court challenges and has experienced delays. Now, however, it seems to be ready to move forward. The question for the poll this week is what qualities should be priorities of the project? Please select your top from from the list provided in the poll in the right sidebar. 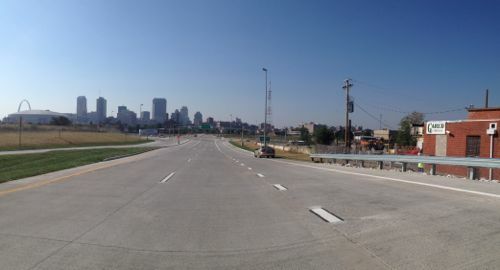 Yesterday MoDOT and city officials cut a ribbon to open traffic from I-70 onto the new Tucker. Officials cut the ribbon opening the off ramp from I-70 onto the new Tucker on September 26, 2013. 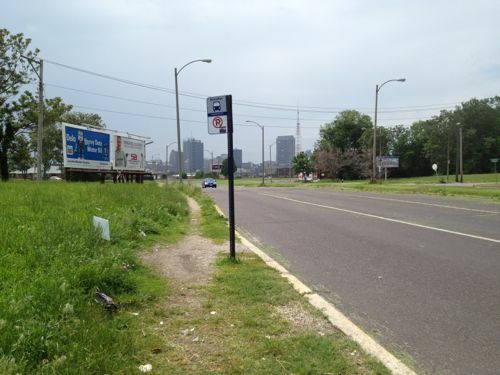 The land surrounding thus on/off ramp is now more valuable. 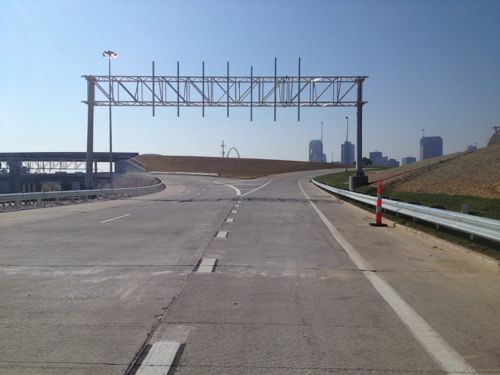 With the new offramp, and the opening of the Stan Musial Veterans Memorial Bridge in 2014, the adjacent land is suddenly prime real estate. 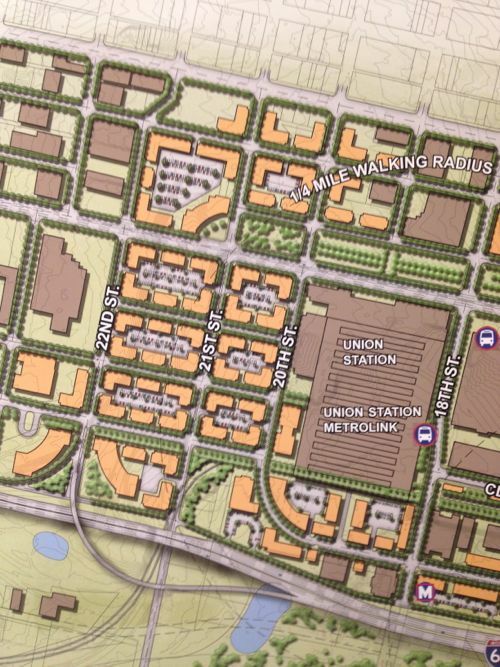 Will it be developed like most highway offramp areas or will it be more urban/dense/walkable? I don’t have any illusions the city will make any such demands so my only hope is Paul McKee comes through with a plan the surprises his many critics. The project to replace the old Tucker Blvd, filling in the long-abandoned passenger rail tunnel, is nearing completion. Motorists and pedestrians can now travel between Washington Ave and Cass Ave., approximately 3/4 of a mile (map). Tuesday night the boyfriend and I went for a walk up to Cass and back (I rolled, he walked). I’d been up/down the new Tucker a few times before but this time I paid attention to the plantings located in bulb-outs at the ends of parking lanes, medians, tree lawn, etc. 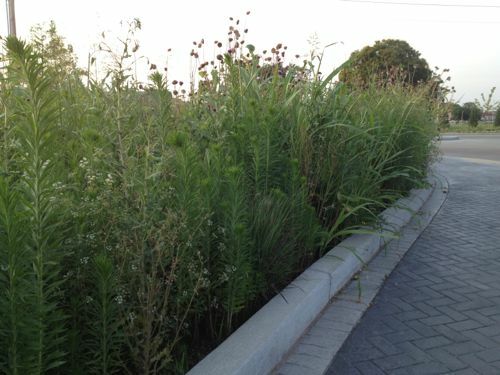 Some of the bulb-outs are designed as a rain garden, set up to catch rainwater from the road and sidewalk. 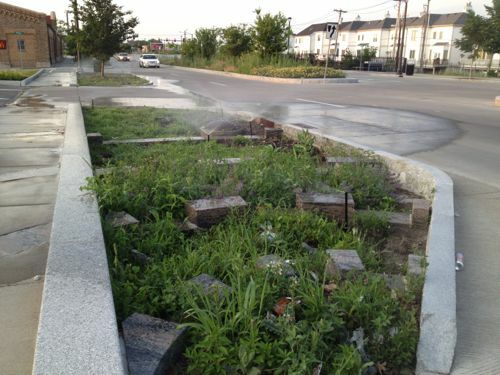 Irrigation in one of the rain gardens along North Tucker Blvd. I suppose irrigating a rain garden makes sense to keep the plantings looking good during dry spells, and while establishing the plantings. Very tall weeds have taken over some planting areas along Tucker. 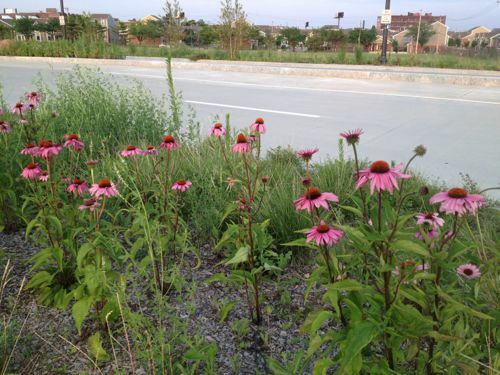 Purple Coneflower (Echinacea) is just one of many natives planted along Tucker. Other plants spotted include Yarrow, Russian Sage, and native prairie grasses. I’m excited to see Tucker 100% complete with all the planting areas weeded. 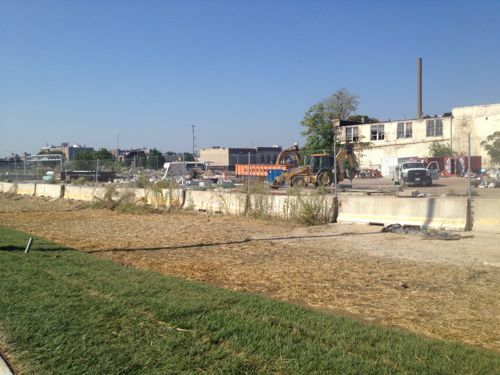 I’m also looking forward to seeing development occur along Tucker, especially at Cass. Looking north from Cass & Tucker the approach to the new Mississippi River Bridge is nearly complete. The bridge opens in early 2014, click photo for more information. 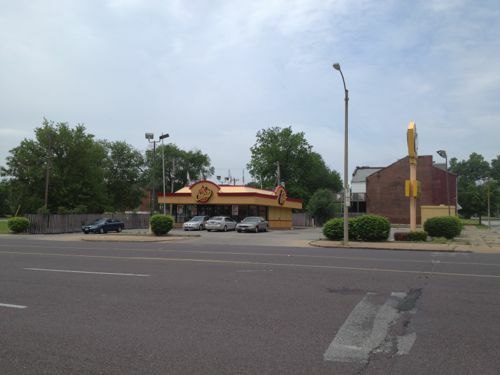 Potential Development Sites Along Proposed Streetcar Line, Part 3: 14th & Olive To North Florissant & St. Louis Ave. In the first two parts of this series on development sites along a proposed streetcar route I looked at Olive from 15th-16th and Olive from 16th-18th. In both cases it was a small area and I looked a specific buildings and parcels of land. 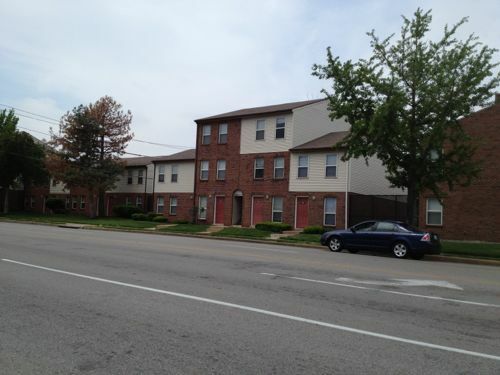 Heading to N. Florissant Ave. & St. Louis Ave. nearly everything is a development site. Let’s start downtown and work our way north. At 14th & Olive you have the library on the NE corner and the library administration building & a charter high school on the NW corner. I think the library admin building has office space available for lease. 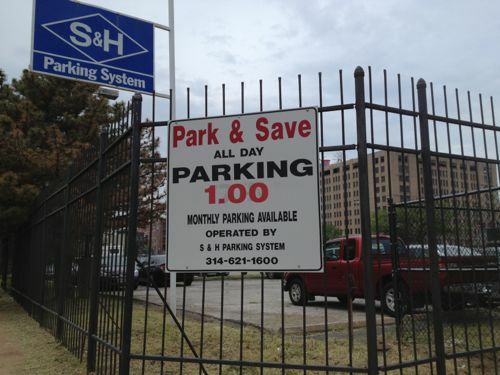 The parking lot at 14th & Locust is privately owned, a good candidate for new construction. 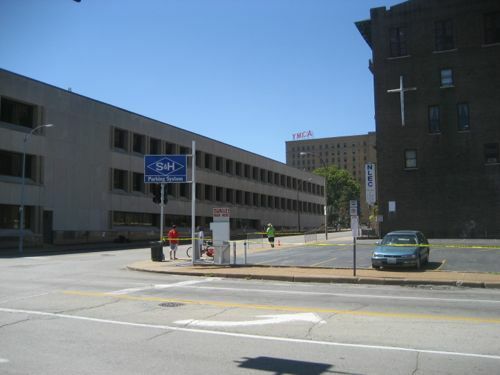 Photo is from 2007 before the charter school added another floor to their space on the left. 1400 Washington has had numerous development plans, it is now becoming a parking lot, same owner as the previous lot across the alley. 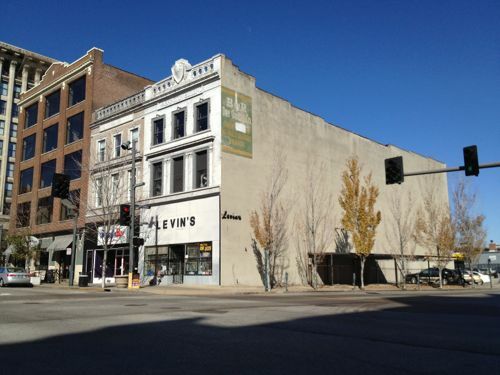 I’d like to see these two buildings on Washington Ave west of 14th get renovated, along with a thin wedge between the east wall and 14th. Photo from 2011. Before we go any further north it makes sense to look at the route on a map along with a development zone on each side of the line. Light rail has stations miles apart, whereas streetcars are more like buses by having more frequent stops along the route. 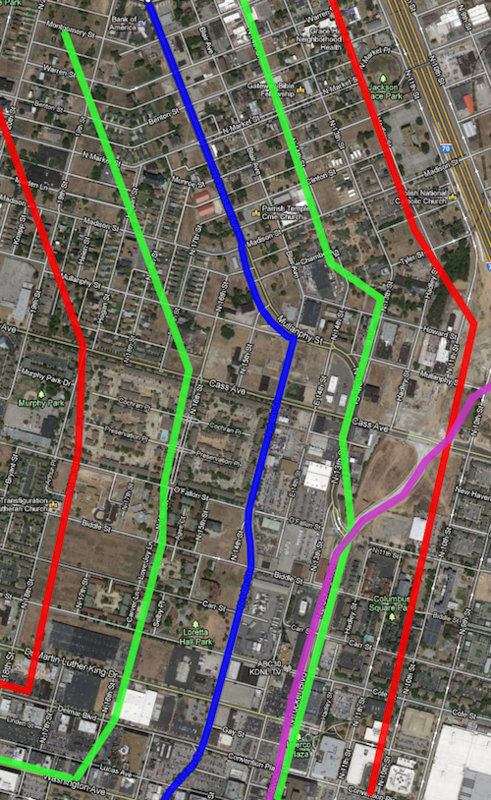 The blue line is the proposed streetcar route, green about 660ft (1/8th mile) and the red about 1,320ft (1/4 mile). Purple is the new bridge connecting into Tucker. The area between the green lines is the immediate area that I estimate to be part of a special transportation district with slightly higher property taxes, pro-rated based on distance. The red lines are a quarter mile distance, the usual distance a person is willing to walk. 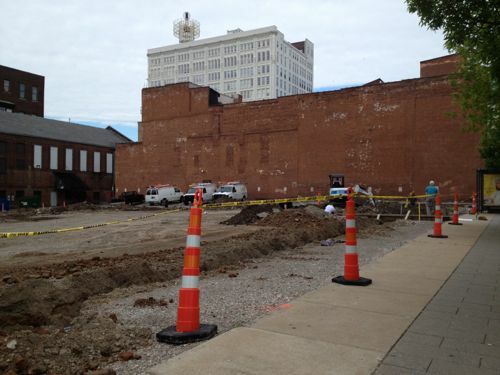 Quite a bit of this area is in what will be one of the Northside Regeneration job centers. 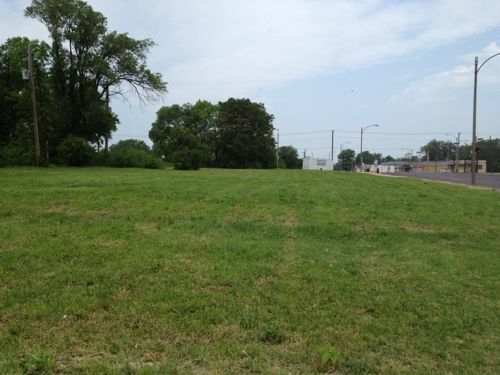 Numerous parking lots occupy significant land north of Washington Ave, ideal candidates for new construction. A former BarnesCare building built in 2001, is now vacant. With no pedestrian access and large setbacks from both MLK & 14th this building should be razed and a new urban building constructed on the site. 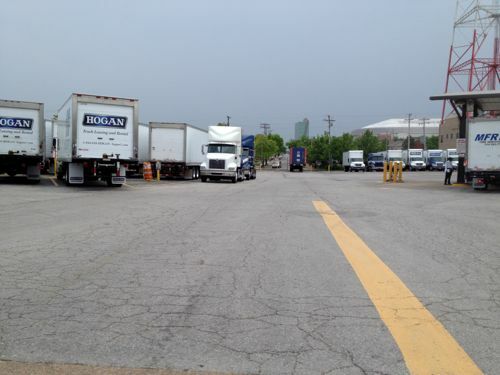 Hogan Trucking uses two city blocks, Carr St has been vacated. 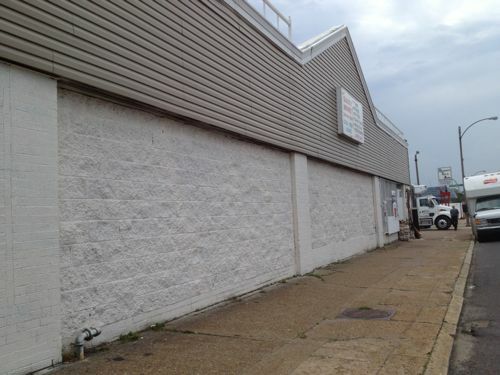 Interestingly the property owner is listed as Hogan Redevelopment Corp. 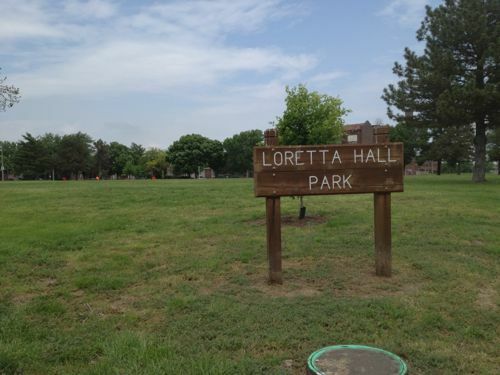 This site must legally remain a public park, as it has been since 1842. 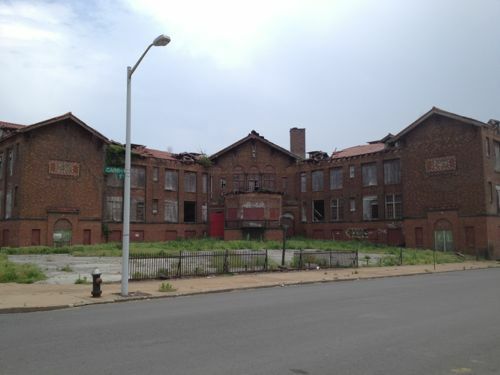 Many would love to see the crumbling Carr School get renovated. Click image for more information on this 1908 structure. 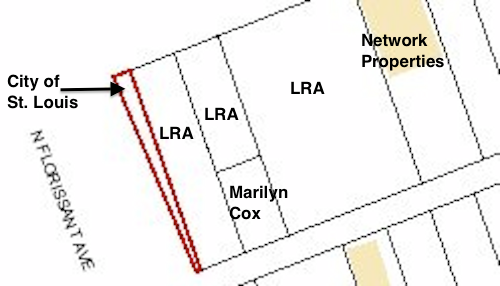 7.9 acres ready for development, the original lot boundaries remain since they were never consolidated. On the west side of 14th, south of Cass, is the O’Fallon Place Apartments owned by McCormack Baron Salazar. Looking NW on N. Florissant from 14th, vacant land and mostly vacant buildings are all around. The Mullaphy Emigrant Home at 1609 N. 14th could finally get renovated if the streetcar connects the near-north side to downtown. Click image for more information on this historic structure. 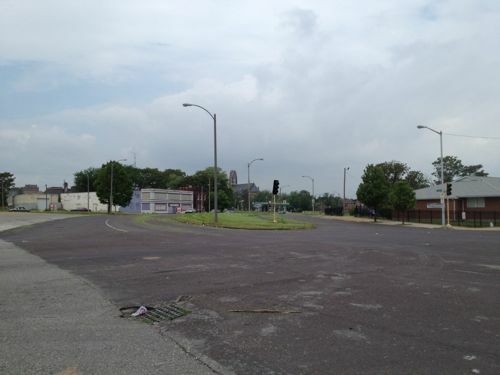 Looking back toward downtown we see evidence of disinvested in the area along N. Florissant near Madison St. 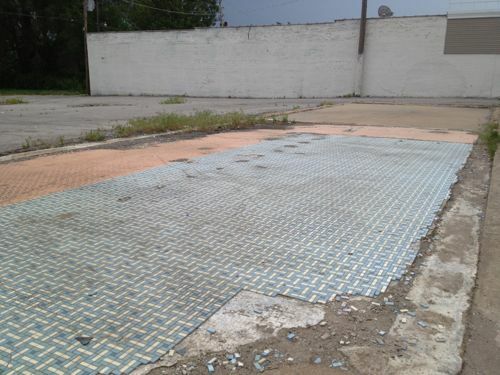 The city says property owners are responsible for sidewalks but in this case the city is the property owner. 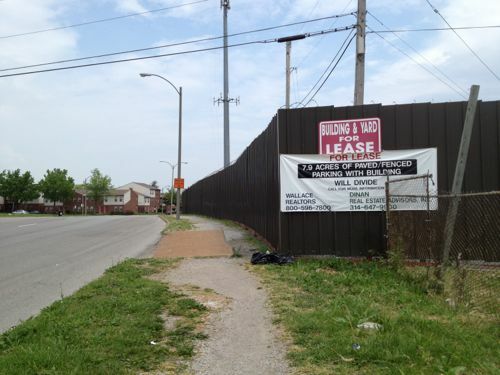 The City of St. Louis is the legal owner of the 668 sq ft wedge-shaped lot at 1458 Madison St. This small building at 2100 N. Florissant Ave was built in 1906, the owner is in St. Louis County. 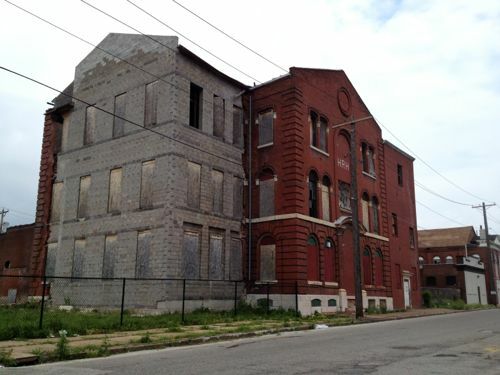 A bank in Illinois now owns the unfinished daycare at 1501 Clinton & 1500 Monroe. The buildings to the north are owned by several owners, including the LRA & Northside Regeneration. 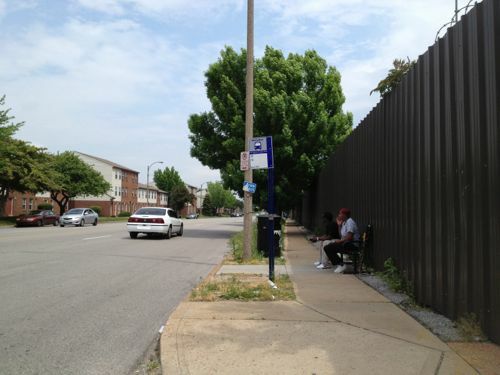 The mostly vacant St. Liborious complex at Hogan & North Market is a city landmark, it is privately owned. Click image for more information. 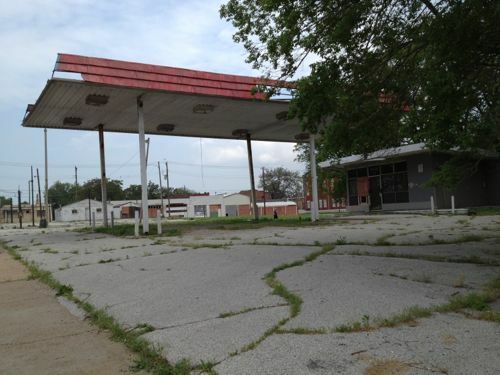 The vacant gas station at 2418 N. Florissant was built in 1972. 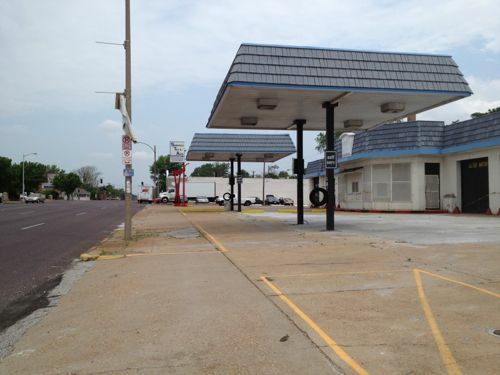 Two blocks north at 2618 N. Florissant is another vacant gas station, this building has been modified many times since 1938. 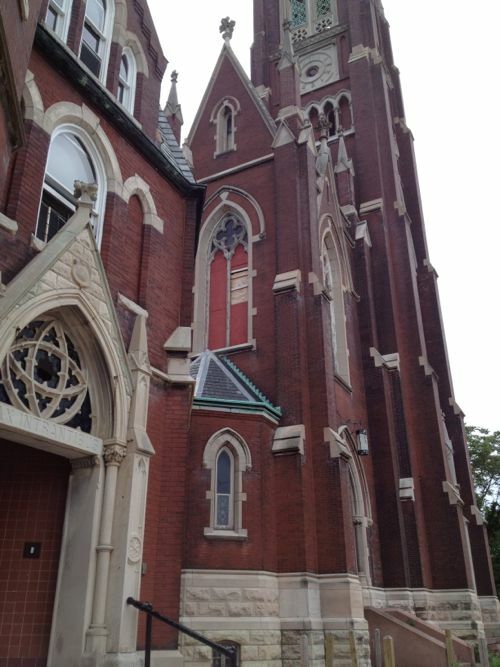 This building, owned by a person in Atlanta GA, needs to be replaced. 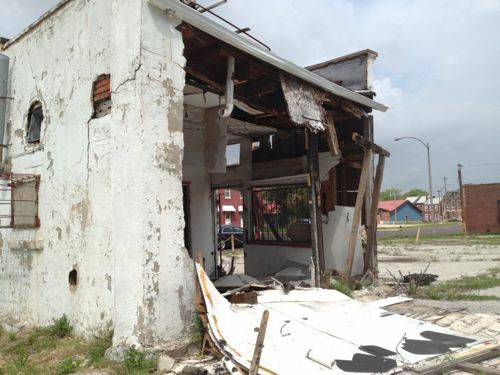 The Church’s Chicken could operate out of a storefront in a new building. This building from 1940 should be replaced. 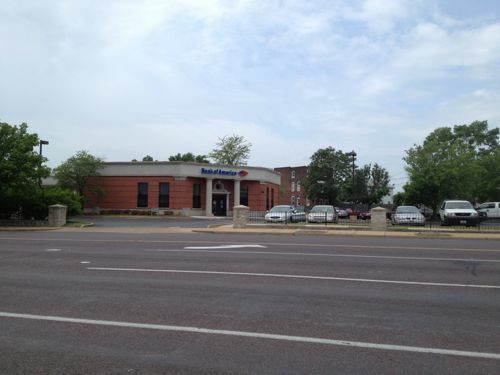 This bank was built in 1993 after the urban bank at the corner of N. Florissant & St. Louis Ave was razed, despite neighborhood objections. This should be replaced with an urban building on the corner. With so much vacant land & buildings, this stretch of the proposed streetcar line has the greatest potential for redevelopment. It will also be a challenge initially to get projects funded. 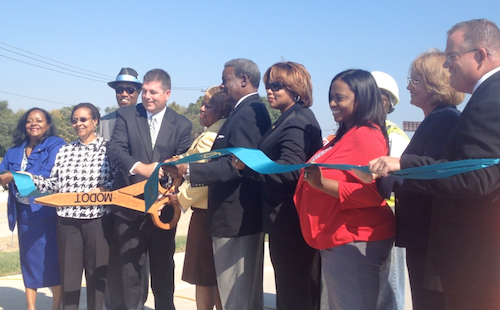 Once the line is open and Paul McKee builds one of his job centers near Tucker & Cass things will start to take off. Form-based codes requiring dense urban design will be key to getting the right kind of construction. It’ll take at least a decade, if not two, for this to be built out. For years I’ve been accused of being a naive dreamer, coming up with big plans without the existing market to implement. I’ve just smiled and continued sharing my long-term vision for St. Louis. By May 2009 I noted that St. Louis’ 22nd Street Interchange Part of McKee’s Plan so it elimination would need to be worked out with him. Presumably MoDOT agrees with McKee because they’re replacing the Jefferson bridge over I-64/40 with no plans for on/off ramps to/from the east. Then, last month, at an St. Louis Regional Transit Oriented Development Study presentation around the Union Station & Civic Center Metrolink stations the Denver-based consulting firm suggested largely what I had outlined years earlier. Preliminary plan around Union Station, the Drury (former YMCA) and other existing buildings should be shown in the final presentation. 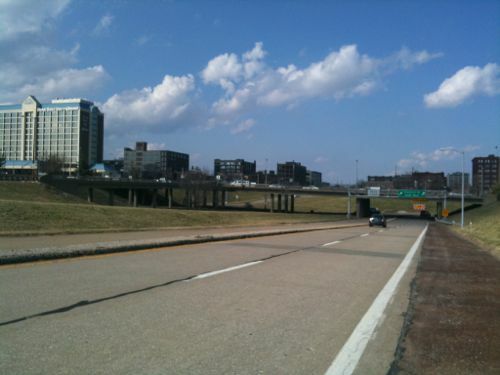 Ok, they still have on/off ramps for I-64/40 to the east, but they are compact and feed into the reconnected street grid I had advocated. The above image is preliminary, I pointed out it was missing buildings like the Drury Inn on 20th, formerly a YMCA and later a gay bar/hotel/bathhouse. Hopefully their final will be more accurate than the draft shown at the last meeting. Still they see what I and others saw, the need to repair the street grid and fill in the gaps in the urban fabric. 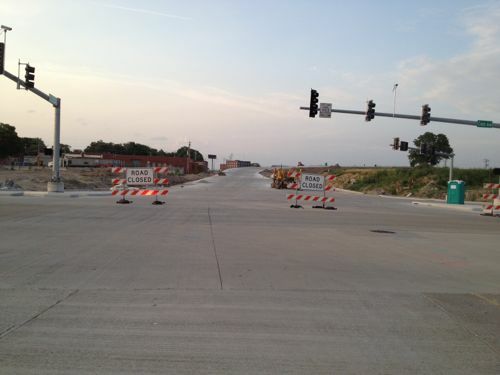 The 22nd Street interchange is just on/off ramps. This is not about trying to recreate the buildings and feel of the area prior to the demolition for the highway interchange. This is a forward-looking vision to create a walkable/urban environment for those interested in such. Some prefer the look & feel of new buildings, new sidewalks, new trees, etc. This is an opportunity to create an entirely new neighborhood largely from scratch yet have access to existing transit. 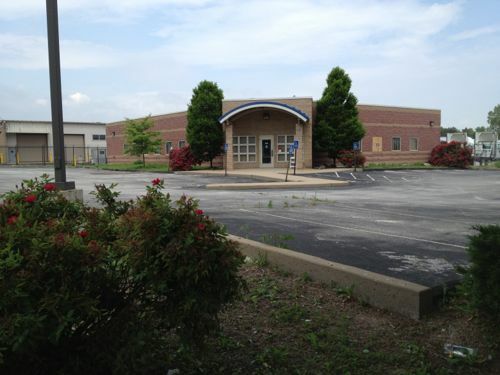 Per McKee’s plans, a few new employers could anchor the neighborhood. Workers & residents would attract restaurants, dry cleaners, and other services. None of this is rocket science, it’s Urban Planning 101. 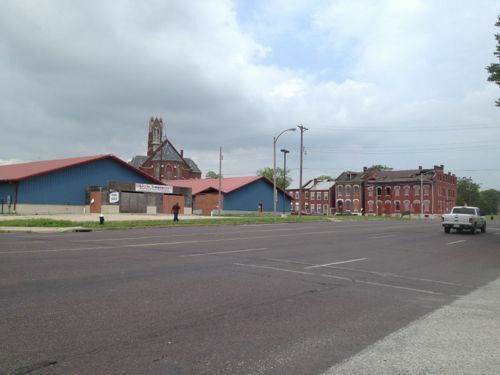 St. Louis still needs lots of basics to rebuild the connections that were ripped out in the 20th Century.